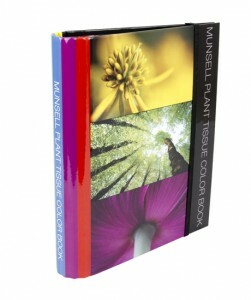 Grand Rapids, MI – February 1st, 2013 – Munsell Color, part of the X-Rite company and the leader in producing physical color standards, today announced its latest new book release, The Munsell Plant Tissue Color Book, a handy plant color reference for analyzing plant tissue color. For any botanist or scientist, the 17 plant color charts offer a fast, convenient method for identifying and communicating the color of plant tissue by cross referencing ISCC-NBS color names with the unique system of Munsell notations for plant tissue samples. The Munsell Plant Tissue Color Book provides scientists, students, and plant growers with information needed to respond to problems related to taxonomy, genetics, physiology, pathology, and plant nutrition. For more information, contact Art Schmehling, at (616) 803-2703, or email aschmehling@xrite.com. Munsell Color is comprised of the original Munsell Color Company that Albert H. Munsell started nearly a century ago. The company, based in Grand Rapids, Michigan develops and produces physical color standards based on Munsell color theory. The result is a variety of simple yet accurate visual color tools that help professional, artists and others with color more effectively. Munsell is part of X-Rite, the global leader in color science and technology, which also includes design industry color leader, Pantone LLC. Munsell color tools are used across a wide range of industries. For more information, visit www.munsell.com.